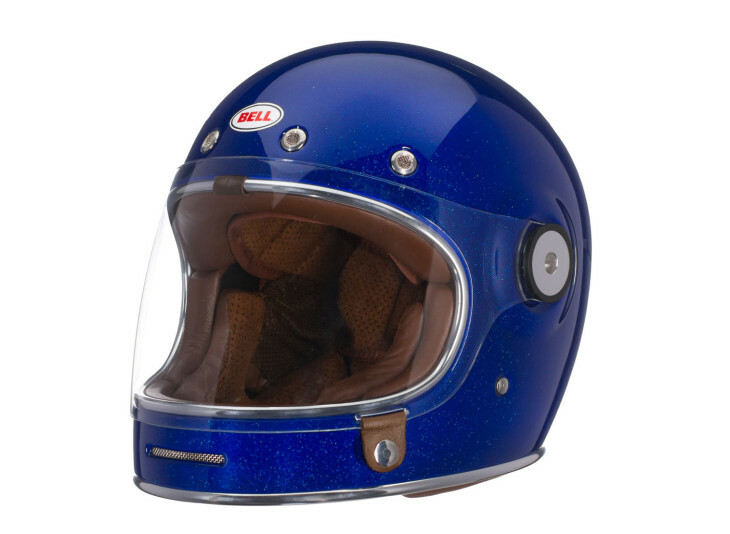 What do you do if you ride a cool retro muscle bike like a Yamaha XS11 and you want the extra security of a full-face helmet that looks good with a 38-year-old motorcycle? There wasn’t much on the market four years ago, when industrial designer Chad Hodge was still in design school at University of Cincinnati. So he made his own. “I went to get a new helmet and there wasn’t a retro-styled helmet that would go with the ’70s Japanese muscle bikes,” the 28-year-old Kentuckian told me. “There were only 3/4-helmets available, but I think that’s crazy to wear those.” So do we! In fact, Hodge reported that “after a buddy got his face saved by his full face, I don’t wear anything but.” Good man. Hodge didn’t need to re-invent the wheel—he only had to go back to photos of the old Bell Star, the first mass-produced full-face helmet. 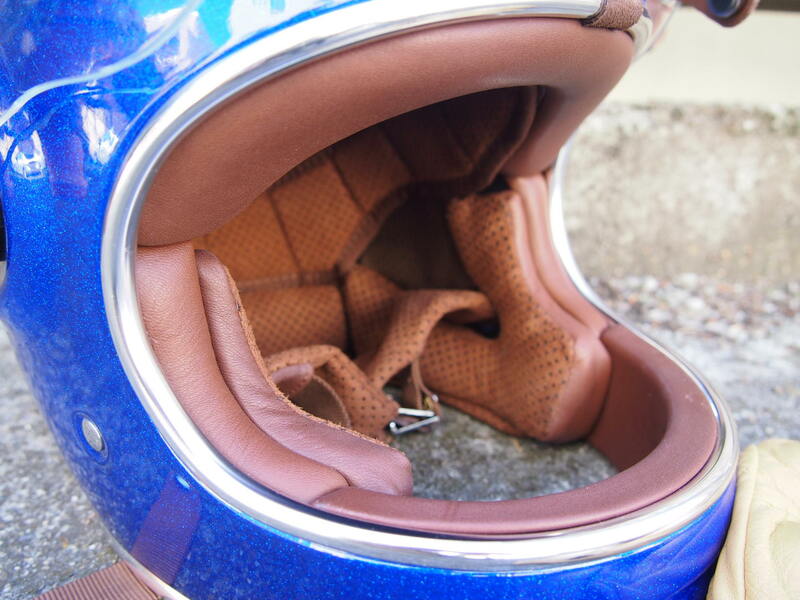 Hodge used it as inspiration, appreciating its “pure, spherical form.” The resulting design (and Chad’s senior thesis) appeared on the Bubble Visor blog in 2010, predating other retro full-face designs like the Biltwell Gringo or the $1,250 (!) Ruby Castel. And that’s what it takes to get hired by Bell Helmets to work as an industrial designer. Bell took on Hodge and started production of the Bullitt with few changes. I asked Bell to get one to test, and am impressed with this helmet. The Bullitt looks old, but the materials and engineering are pretty modern. The shell is composite and the liner is multi-density EPS foam. The comfort liner is microsuede and there are even speaker pockets if you want to defile the sleek looks with a Bluetooth headset. What’s amazing is how compact it is—it’s noticeably smaller than my other lids and the chinbar is close in to my mouth. But it’s not uncomfortable (though the snaps for the removable comfort liner dug into my forehead) and the huge opening offers unparalleled peripheral and downward vision. 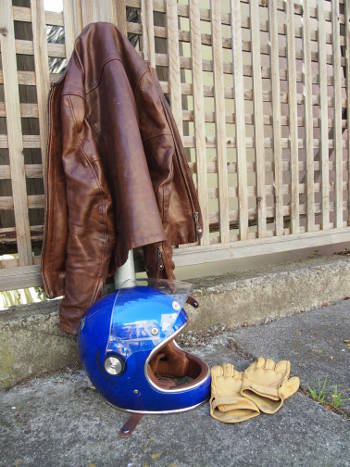 On the bike, it’s a pretty good helmet, especially for vintage riding. 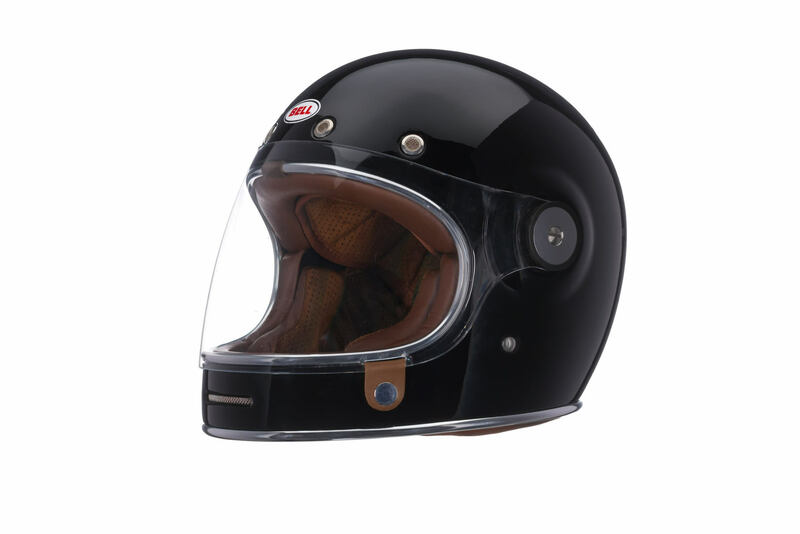 It’s noisier and draftier than a modern sport-touring helmet, probably the same as period helmets would have been, nicely recreating that vintage experience. The visor offers excellent optics (I tested the flat clear) and Bell’s anti-fog treatment works as well as anything short of an insert like the Pinlock or Fog City. It’s also pretty light, about the same as the Shoei RF1200 I’m testing, at 3 pounds 5 ounces. You’re not sacrificing much utility for a lot of style. But I was concerned about safety. The chinbar is skinny and very close to your face, so am I taking extra risks wearing it? Chad pointed out the Bullitt meets ECE as well as DOT standards (although he didn’t say if it met the standards with or without chinbar) and there is EPS foam in the chinbar—it’s not just decoration. Is it as protective as a high-spec racing helmet? Probably not. Better than a 3/4 helmet you bought at a garage sale? Almost certainly, by a very large margin. What’s interesting about the Bullitt is the customizability and the lengths Chad and Bell went to keep the look retro. The shell comes in 5 colors—there are more schemes on the way, including limited-edition graphics and artist series—and you can choose several different faceshields, including yellow-tint, smoke or iridium in flat or bubble. You can also remove the faceshield and ride with goggles or shades—the sideplates mount flush (well, flush-ish) with the shell when you remove the shield. The cool snaps above the vision port are actually little mesh air intakes, and the faceshield secures with a magnet, minimizing external hardware and keeping the look as clean as possible. I also like the chrome edging (Chad said the smooth shape needed something to make it pop) and leather trim. The Bullitt is $399, but that’s cheaper than the original Star, adjusting for inflation, and the fit, finish and feel justify the price. All that stuff indeed! Not to worry, Chad—I get it. I think enough vintage riders—or even riders who just want something simple, elegant and cool will get it too. Chad says he’s working on more designs for Bell, including more retro projects as well as modern helmets. Stay tuned. For Mother’s Day this year: Go Ride! The problem with full face helmets – when you ride a Harley or other V-Twin cruiser – is that they echo and magnify the exhaust. I’d like to see someone design a full face helmet with ear holes so that wouldn’t happen. I’d like to see you guys leave the stock pipes on so I don’t have to hear it. Perhaps I should begin by apologizing for my lack of compassion .. This is quite possibly the most preposterous idea I have ever encountered. It is of course possible for sound to reverberate between two parallel reflecting surfaces, and for standing waves to set up, the amplitude of which can become very great indeed so long as the supply of acoustic input remains in place. Yes, that is possible, and it is the only physical phenomenon that remotely resembles what your are claiming. Well, in the interest of completeness there is also the Helmholtz resonator effect, but as concerns standing waves, it takes two reflective, parallel surfaces, and there just isn’t any way. And if it did happen, the longest wavelength affected would be twice the distance between the surfaces, so if there were actually any flat, smooth surface at the outside of your ear, the critical distance would be not more than an inch, which means that the lowest frequency affected would be nearly 7kHz, corresponding to a wavelength of about 2 inches. As for the possibility of Helmholtz resonator effect, this is the effect by which sound is produced by blowing across the mouth of a bottle. It is also the principle by which ported loudspeakers work. The air in the neck of the bottle behaves like a mass dangling on a spring, while the air down inside the bottle provides the spring. It is not uncommon to find this effect occurring to a minor extent in natural, unexpected places, but you have to have a chamber that is completely closed except for the neck or tube where air can move back and forth. It is highly unlikely that this effect will occur to any appreciable degree inside of any helmet, and especially not for any low frequency, since that requires a large chamber (weak spring) and large neck or tube. Now, I bothered to explain all that just so that I could say this: wtf are u talking about? People come up with some of the strangest ideas. I really would like to know how you came up with this idea. You don’t know what you’re talking about. Come back when you’ve ridden a big V-Twin with a full face helmet on. Oh, Jamo, I assure you that I very much know what I am talking about. You claim that the helmet actually amplifies the sound from the engine. At face value this is preposterous, but I went to the trouble to give a brief explanation of how it might actually be possible, and then explained why it just would not happen. 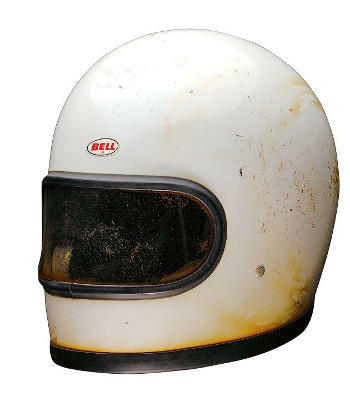 There are already too many silly reasons why people don’t wear a helmet, e.g., they make me look like a sissy or like I’m afraid to die, they mess up my hair, the people in the gang that I want to be part of do not wear them, etc., etc. Do you really think we need any more silly excuses for not wearing a helmet? But, if awards are handed out for coming up with the most ridiculous reason imaginable for not wearing a helmet, you would probably win that award, because any reason even slightly more hilarious would be funny enough to have everyone rolling in the floor, which is probably the reaction that a lot of people had to the claim that you are making. I once heard an excuse that was just as bad. The cruiser rider told me, with a straight face, that he couldn’t wear a full face helmet because it interfered with his vision. He claimed that he had a field of vision greater than 180 degrees and that’s why he had to wear a cereal bowl-type helmet. much quieter than a rental (open face HD) helmet I wore on the way home. This is one of the most absurd arguments I’ve ever heard. No disrespect intended Jamo but I think any rider with miles under their tires (I have been riding since 1972) can tell you that unless you have a salad bowl on your head you can probably here BETTER with a helmet, full face or otherwise, regardless of the pipes being stock or straight. Sound exists the back of the bike, not straight up or forward. You will hear the drone of the engine/exhaust sound but it doesn’t resonate IN the helmet. The helmet keeps the extreme noise out, kind of like earplugs. In fact the only reason I have had to add earplugs is due to wind noise which totally cancelled the engine noise or any other sound (this is without a fairing). Without a helmet the wind noise is deafening (not to mention bugs/rocks/sand/rain hitting your face at speed). With that helmet you’ll probably get a lot of that V-twin echo magnification effect. one of the more interesting full-faces I’ve seen in quite a while. ‘Damn I hope that think comes in sizes big enough to fit my pumpkin-head….. I love it. But what really sounds unique is “the faceshield secures with a magnet” – this sounds way better than the confusing mounts on my Arai. I can see something this simple and elegant making it’s way quickly into the mainstream market. Cool. So, it’s not Uncomfortable, but not exactly comfortable, either. Another use for duct tape? I just like it because of the large opening. Most full-face helmets give me claustrophobia, I’ve been wearing an Arai XD “adventure” helmet since they came out for the large opening. All this crap about wearing this because you have a vintage bike is kinda metro-sissy. I didn’t start riding until 1965, but the Bell Stars I remember had much larger chin bars and much smaller eye ports. Talked to the Bell reps at Daytona. They said they can’t keep up with the orders. Good for them. They aren’t cheap either. At a recent bike show I came across an RD350 and Kawi H2. They were in better than new condition with modern 600 super sport wheels, front end and brakes. Next to one of the bikes was the new Bullitt. I think the helmet had more comments and generated more buzz than the bikes. Mission accomplished. Man I just don’t get these things. I understand for the guys that were kids when these things were original it’s a time machine kind of deal. The 20 something hipsters love of this kind of stuff just baffles me. Better than nothing I suppose. They love it for the same reason you love some bikes and not others within a same category (sport/naked/etc). Sure, but can we put these thru say a Sharp helmet test with a Bell Star for example and see which is safer? Looks which are pure personal choice aside. I’m curious of the safety of the retro design vs. current designs (X12, Star, Corsa etc.). Yes they’ve updated the materials within the Bullitt to modern specs, but why have current helmet makers move away from this style and shape other than aerodynamics? Q: but why have current helmet makers move away from this style and shape other than aerodynamics? I’d be willing to bet it’s at least partly about what the writer mentioned in his review–that design is louder and more drafty than modern helmets, and as a commenter noted, has very few air vents, so is also likely a lot warmer in summer months. Form follows function, yes, but it also follows what your client base demands–better safety features, less wind noise and less drafts. All you need to add is a white John Travolta disco suit, a pair of platform boots and a thick, gold-plated, rope necklace. And a Twiggy look-a-like on the back of the bike! 1963 Bell Star =’s Bender from Futurama. A robot with a drinking problem! And with an antenna problem. How can the helmet not meet the safety standards with the chin bar if it doesn’t have a removable chin bar? Could you clarify what you were getting at with the with/without chin bar comment? If this helmet meets chinbar requirements it shows the chinbar doesn’t have to be very wide to do that. These helmets are for fashionistas, not those of us who want real protection in all kinds of weather, conditions. I see next to no venting for hot days. Er…it has a chin bar, and it passed the standards. That means it met whatever the chin bar requirements are. I don’t get why there is apparent ambiguity here. Well, the DOT tests don’t include any chinbar hits, I believe. And as I understand it, the ECE has two tests, one for open face helmets, and one for full face. So, for example, a movable chinbar helmet can be submitted for testing under the open-face standard, and be approved, but that doesn’t necessarily indicate that the chinbar has been tested. I don’t know if a helmet which clearly has a solid chinbar can be tested and approved under the open-face standard, though. ECE has three tests, one for open-face, one with a protective lower face cover, and one for a non-protective lower face cover. The question is which of the latter two was used. What kind of dome do you have Gabezilla? I’m the Arai long oval type and I find most helmets too round for me. Where would you say this one is on the scale? Like the other Bell’s I’ve tried, I think it’s better for the rounder sort of head. Arai doesn’t fit me well. But you should go try one on to make sure! I’m down to a K1600 GTL and a Vino. This lid doesn’t go with either. I love the Bells- they have some great designs. If you buy one of these and a pair of Gasolina Midnight Edition Classic Boots, then you have some good excuses to buy a modern retro or start a restoration project. get me this helmet, buy these boots, some gauntlet gloves, and add a Brando jacket and i’ll be Goose (no, the original one) from MFP, Main Force Patrol. well that, or I can at least be a member of Toecutter’s gang.